This drawing is the original sketch for 'Oriental Scenery,' part 1, plate 11. 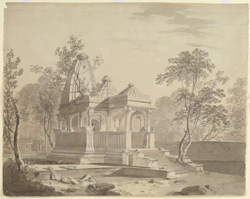 While travelling through Bihar the Daniells came across numerous small Hindu temples, like the one in this drawing, situated in the fort of Rohtasgarh. The artists wrote, 'This building, composed of grey granite, is of singular construction, and has the appearance of great antiquity. The Hindoos, who formerly preferred elevated places for their temples, could not, it would seem, resist the temptation of building in this place, the situation being delightful, and water and wood, with every other convenience abundant."